Expert crafter and lover of Scandinavian design Clare Youngs presents a stunning collection of gorgeous gifts, soft furnishings, kitchen items, bags, clothes and accessories to make and embroider. 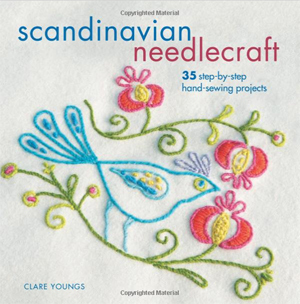 Fans of the clean, elegant lines of traditional Scandinavian style are sure to be inspired by the 35 sewing projects in this book, which fuse classic Scandi motifs including hearts, flowers, and birds with contemporary techniques and materials. Arranged into five chapters, the projects work with a wide variety of fabrics. Progress through the projects and learn a wide range of sewing techniques, including appliqué, cut work, patchwork, decorative machine stitching, shadow work and ribbon work. Simplicity is always at the heart of Clares designs, and the clear instructions and step-by-step art-works mean anyone can have a go. You will be surprised how quickly beautiful pieces can be made.